DAWS is proud to announce our partnership with the Pets for Patriots program! 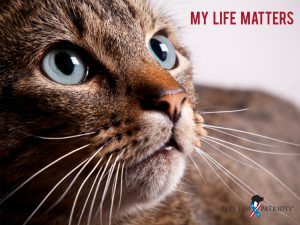 Pets for Patriots, a 501(c) (3) nonprofit organization, helps save lives by helping United States veterans and service members adopt the most overlooked dogs and cats through approved shelter/rescue partners. Their mission is to ease the stress of military transitions on service members and their families through companion pet adoption: return from deployment, active to inactive duty and retirement. The program is open to service and veteran members of the United States military from all armed forces and at any stage of their careers. Pets for Patriots may also help find foster care for pets during their owner’s deployment, if needed. Twenty two veterans take their lives everyday – PTSD and depression are major contributors. A new pet friend gives veterans a renewed sense of purpose and reason to live. 22,000 dogs and cats enter shelters every day. Only half make it out alive. Pets for Patriots helps solve three problems: provides healing to veterans, saves lives of at-risk pets, and helps shelters/rescues adopt the most overlooked, hard-to-place dogs and cats. Pets for Patriots adoptions focus on animals over two years of age, special needs animals, or dogs over 40 pounds, regardless of age. In addition to a discounted adoption fee, military personnel receive financial support from Pets for Patriots through discounts on veterinary care, a $150 gift card contribution to help defray the cost of “welcome home” pet food or other essentials, and pet product discount from sponsors. Go to our Adopt tab to see all of our animals, including those that qualify for the Pets for Patriots Program! DAWS will support the Pets for Patriots program and our military service personnel by offering discounted adoption fees through the program, free life-long rabies and certain other vaccinations for the pet, and a “going home” celebration. We are thrilled to bring two great causes together – support of our veterans and service families, and saving the lives of our shelter dogs and cats. Help us bring loyalty home!